Just lettin’ you know that these pop-able potatoes bites are sponsored by my friends over at Sabra! 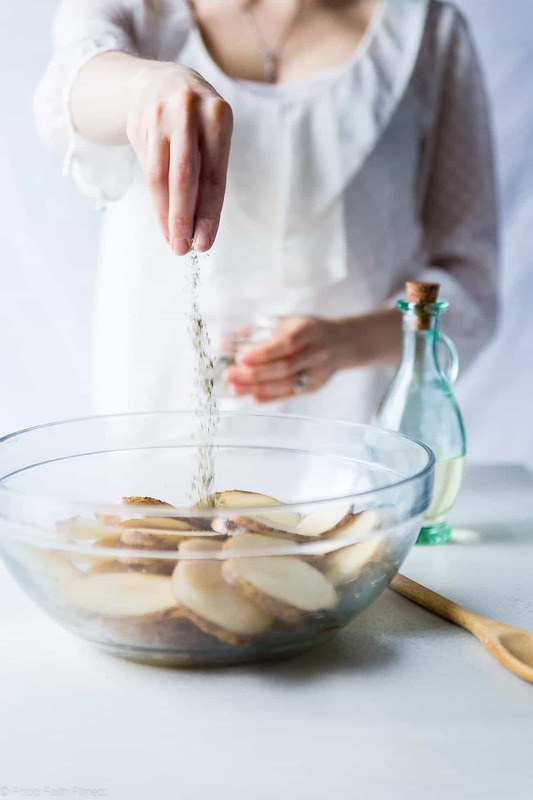 These healthy, vegan Greek potato bites are the perfect party food or snack! They taste like Greek salad and are gluten and dairy free! I bite. You bite. We ALL bite. Guys. 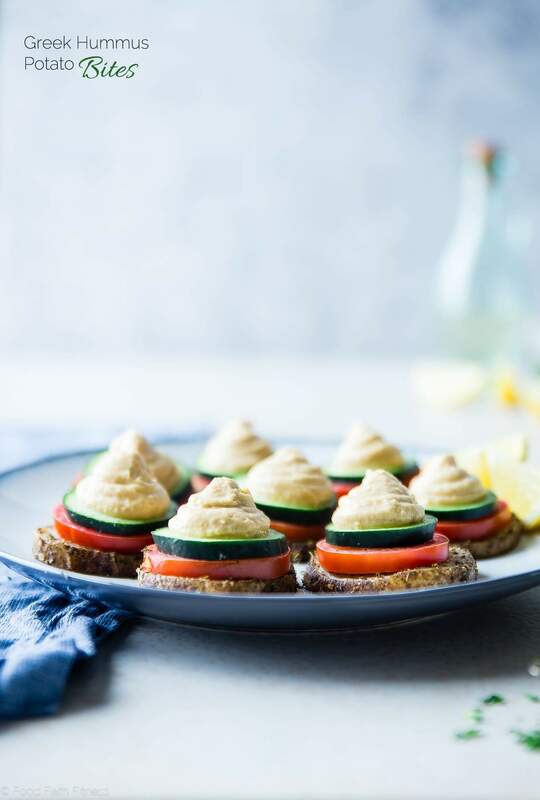 If you thought that we had nailed hummus bites when we consumed copious amounts of lemon sun-dried tomato hummus bites AND cheesy spicy hummus roasted chickpeas bites, YOU THOUGHT WRONG. If you also thought those were the end of my turn-hummus-into-all-things-one-bite then you THOUGHT WRONG, the sequel. My ❤ for hummus AND pop-able, small food items of one-bite BLISS runs DEEP. 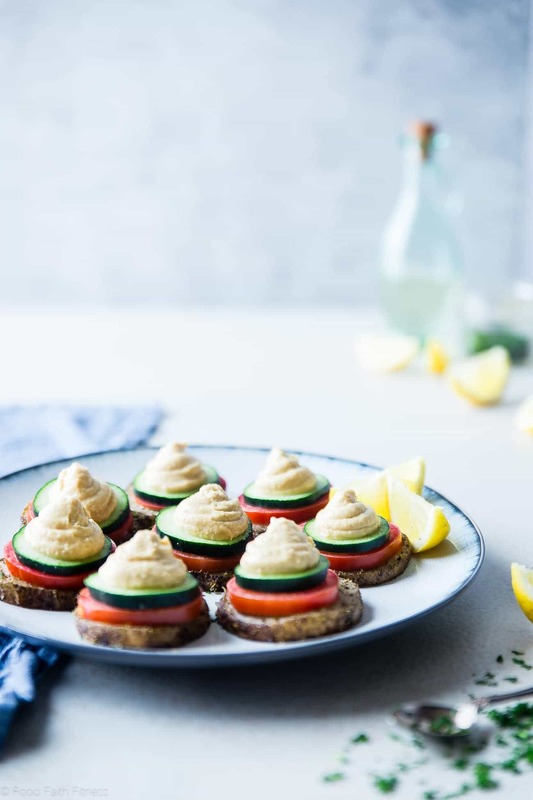 Especially when aforementioned hummus is piled HIGH on top of a tender, herb-PACKED wedge of potato-y, carby-deliciousness and is sandwiching a juicy burst of tomato with a crispy, SUPER FRESH pop of cucumber…that ends with an undertone of zesty, BRIGHT lemon waking up your taste buds. Run on sentences. Sometimes they are SO necessary. Pop-able potato bites are also the ULTIMATE in party food my internet friends. 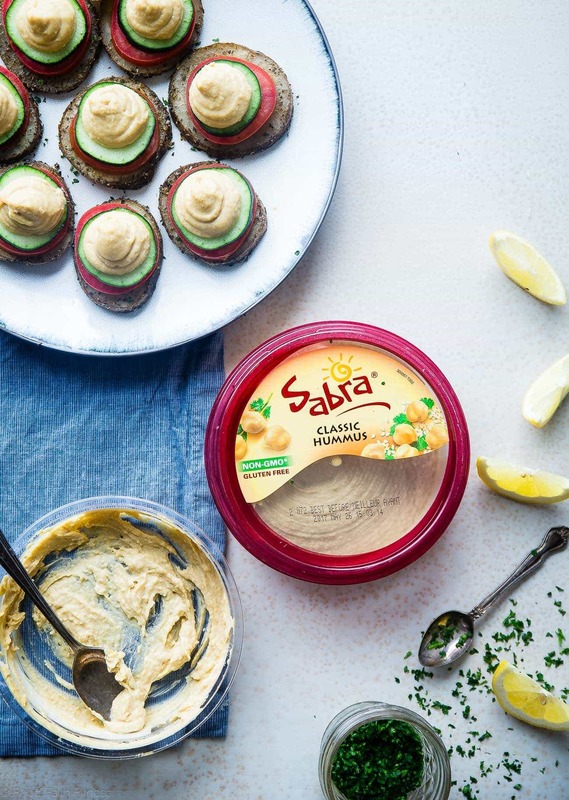 Which is TOTALLY perfect, because I’m helping Sabra celebrate National Hummus Day on May 13th! You wouldn’t want to go to a party without party-food-snacks right? I feel like you and I can both agree that adding hummus to, liiiike, ERY’THANG is a good life choice. Slathering creamy, thick spirals of smooth chickpea DELICIOUSNESS just makes all food taste THAT much better. 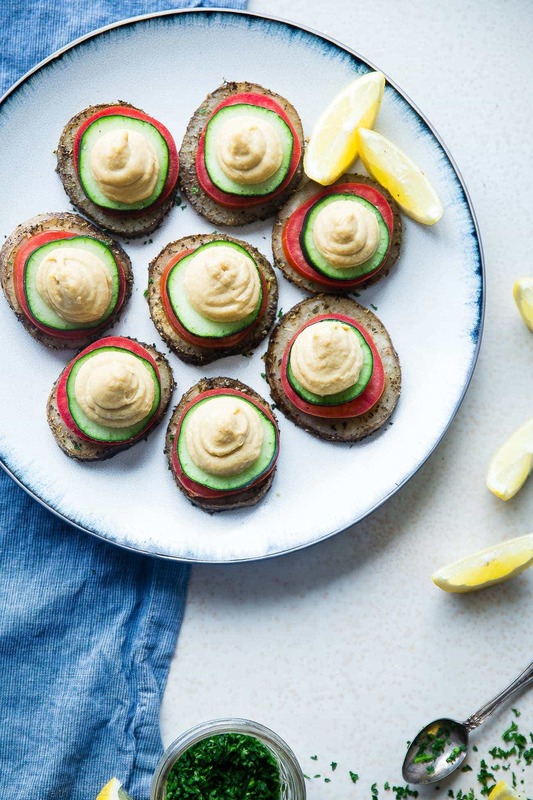 BUTTTT, chickpeas are also little plant-based protein-POWERHOUSES, which means that this little roasty-toasty Mediterranean snack? So perfectly balanced, and filled with real-food nutrition, that you could BASICALLY turn them into dinner. Which is VRY VRY good since they are SO addicting that Mr. FFF and I kiiiiinda devoured so many that they DID turn into an unofficial meal! Don’t lie. You’ve had hummus for dinner too. I have a question for you: have you ever been to a Greek restaurant and eating those AMAZING zesty, lemon-y, fresh roasted potatoes? There is this place growing up that I ALWAYS went to with my family, and I basically wanted to marry those potatoes. Don’t look at me like that. You’ve felt the same about some food in your life. The base of these party-food-potatoes are inspired by both THOSE and last year’s roasted sweet potato pie bites, where we learned that a slice of thick, carb-heaven is the ULTIMATE vessel to PILE on the toppings and stuff into your hungry mouths. 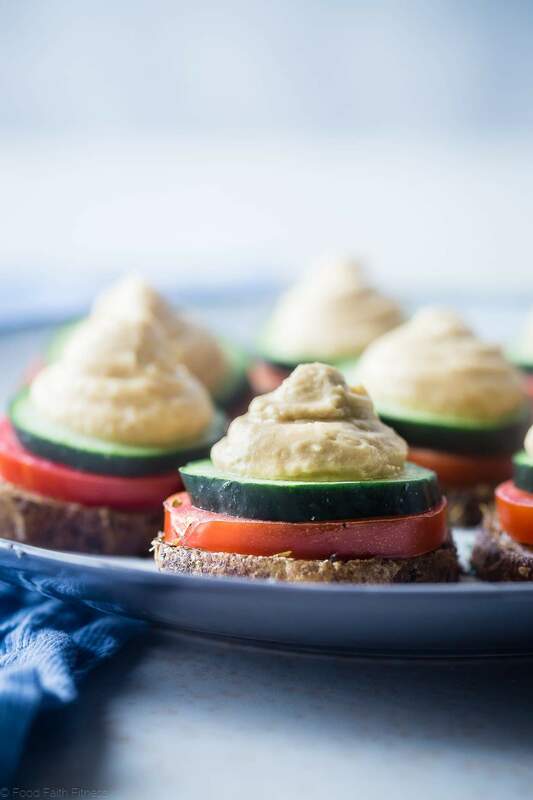 Your mouth is gonna get REALLY excited when your taste buds sink into a pile of creamy, airy hummus then experience the mega crispy-and-fresh-crunch of cucumber, and the tang of juicy tomatoes that balances out the thick slice of HERBACIOUS, tender potato. Preheat your oven to 400 degrees and lightly spray a cookie sheet. Slice the potatoes width-wise into 1/3 inch thick slices. Use a paper towel to gently press out the excess moisture from the slices and place into a large bowl. Pour the olive oil, garlic, oregano, basil, thyme, salt and pepper over the potatoes and stir until evenly coated. Place the potatoes in a single layer on the prepared sheet and bake until fork tender, about 20 minutes. While the potatoes bake, stir the hummus and lemon zest together, seasoning with a pinch of salt and pepper. Top each potato slice with a slice of tomato, then a slice of cucumber, sprinkling the cucumber with a pinch of salt. Finally, divide the hummus between the slices and sprinkle with parsley. These are the cutest! Loving all of the Sabra love this week!! It’s such a fun week right!? Thanks! These are cute and look super fun. I love the potato base and flavors. GAH! These look amazing! Seriously can’t wait for National Hummus Day! I have definitely made a dinner out of hummus before! These little bites are so healthy and full of flavor. Perfect for summer entertaining! I would totally feel no guilt over having this for dinner! Little bites of deliciousness for the win right here! Yes to bites for dinner! These are super cute! Such the perfect little bite! Aren’t bites the best?! Thanks!! I’ve definitely had humus for dinner! I love that you’re on a Hummus bites roll!! you can’t go wrong with hummus in any way! Love hummus! I just picked up a tub of Sabra the other day! These look great! I totally see how you could get carried away eating a ton of these! They look delicious! I’m a big fan of hummus and love the flavor you have going on. These would be perfect for a summer patio party. Totally perfect for that! Thank you! This is such a creative recipe!! Sabra hummus is the hummus of choice in my kitchen so I know the hubs and I would definitely devour all of these potato bites in seconds. Can’t wait to give these a try!! Sabra is our choice here too! Great, let me know what ya think! Enjoy! These are so fun and gorgeous! Love the presentation! Perfect summer appetizer! Thanks! Hope you get a chance to make them! So much goodness here for summer eating season. 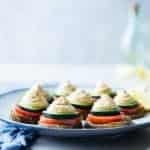 Now I need to get my garden going so i can have some fresh summer ingredients to make these bites! These are totally my kind of appetizer! Yaayy, glad to hear that! Enjoy!